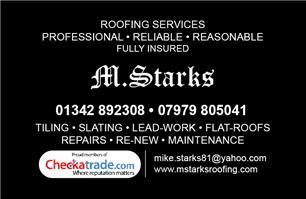 M Starks Roofing - Fascia/Soffits/Guttering, Roofer, Windows/Doors/Conservatories based in Blindley Heath, Surrey. Invoice history based on 364 reviews. Covering the whole of the south east, M Starks Roofing prides itself in providing a high quality, professional and honest service to all our customers. We offer free estimates and planning. All work is guaranteed and we are fully insured. We have earned a trusted reputation in the last 20 years and endeavor to always leave a lasting good impression that our customers can recommend. We undertake all roofing work from minor repairs to complete re roofing. We cover all aspects of moss cleaning to small and large roofs including garage roofs. Using environmentally friendly materials hard brushes and scrapers no chemicals + we carry out all gutter cleaning to all roof types.